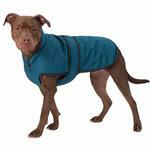 The Juneau Dog Coat in Teal will keep your dog warm on the cold winter days! Stay extra warm this season with the Juneau Dog Coat. Heavyweight wind and waterproof coat with full chest coverage, touch fastener back closure, reflective stitching, elastic leg straps, ID label and leash opening. Shell: 100% Breathe Comfort high-denier nylon. Lining: Poly/cotton with Poly fiber fill. Machine wash cold, tumble dry low. Posted On 03/18/17 by Cecelia R from Washington, DC Yes, Cecelia R recommends this product! Nice looking coat. Easy to put on and take off, and my dog seems to like it too.